After a few months of working in my office, I finally sat down with Mandy to design what I really wanted in there. 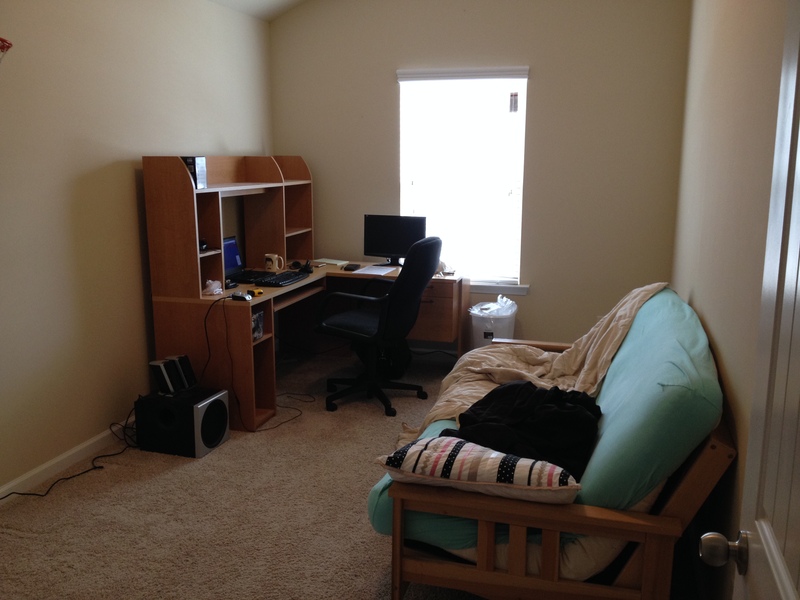 When we first moved in I just had furniture that I had pieced together in college and everything was beige and boring. We decided to keep the futon (mainly because it is the most comfortable futon ever made), but everything else had to go. It was time to start from scratch. I wanted everything in the new office to be dark and dimly-lit like an old-timey library. Naturally I wanted a lot of wood elements as well. Over the course of about a month, we completed a transformation that I couldn’t be more proud of. I can’t wait to spend every day in here working! The first step was paint. 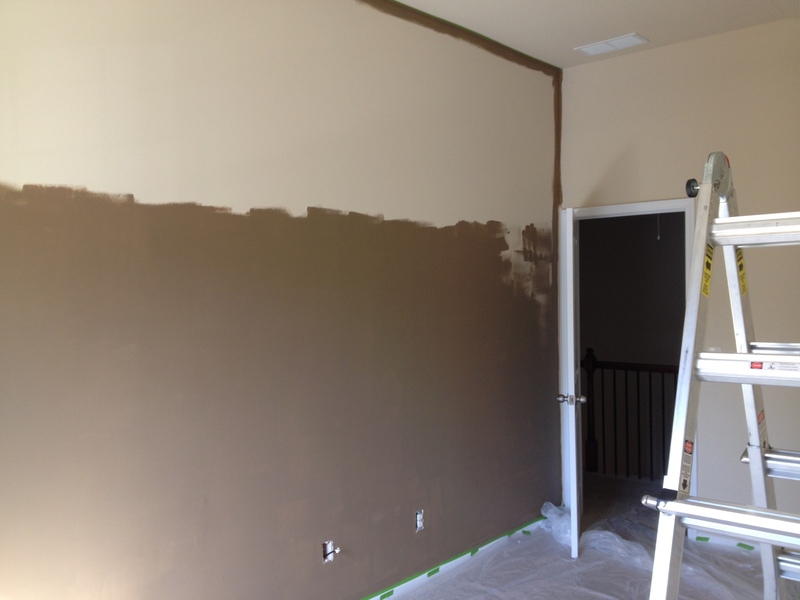 The large wall was going to get covered in pallet wood so I painted brown behind it in order to help disguise any gaps or spaces in the wood. 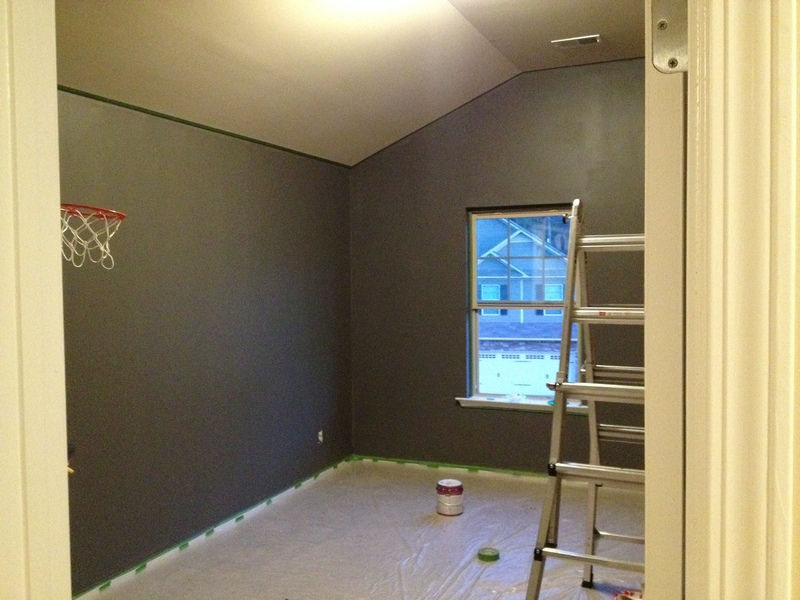 The remaining three walls were painted a color called Dark Granite. 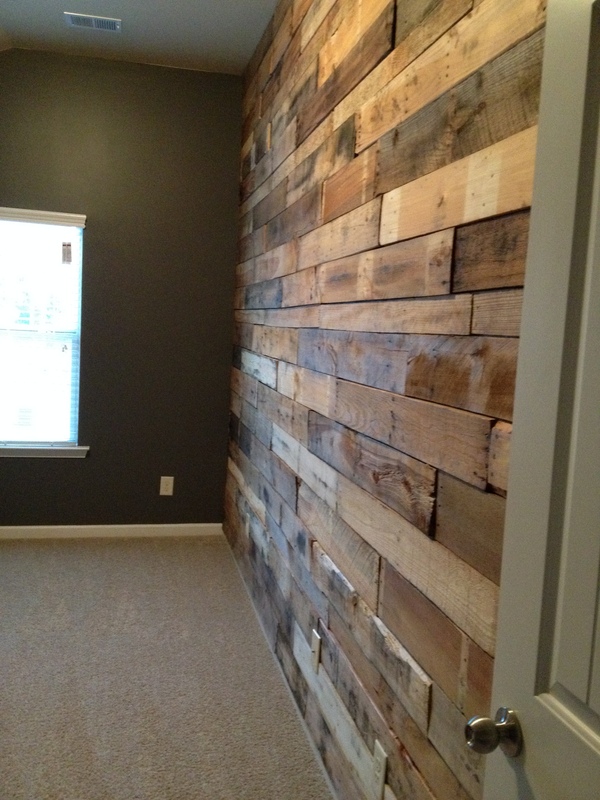 Next I built the pallet wall using lumber from Dixieland Pallet and Equipment. That place was absolutely fantastic! I was able to go through endless stacks of pre-disassembled pallet wood to find exactly the pieces I needed. Best part? I filled the back of my truck up for $50! They saved me countless hours of work of pulling apart pallets and I’m so thankful – I probably would still be working on that. 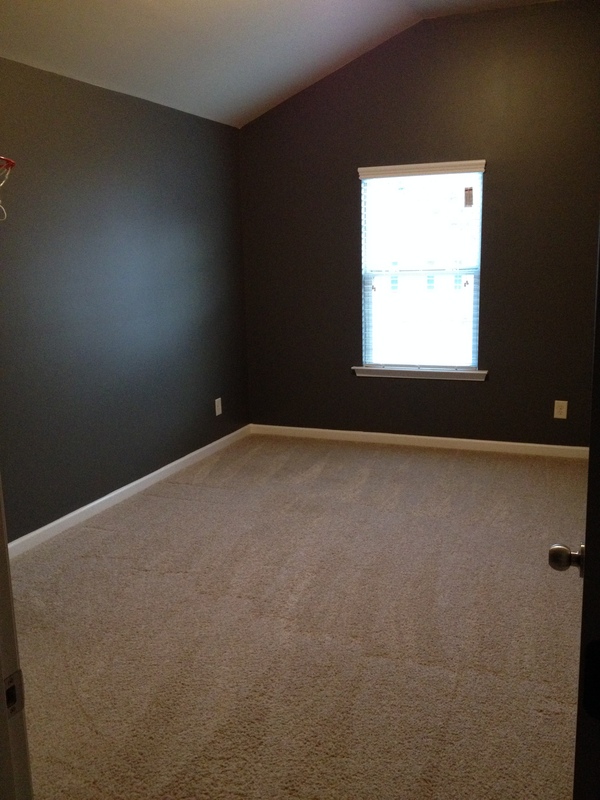 We snapped a chalk line on each stud from floor to ceiling so I would easily know where to nail. 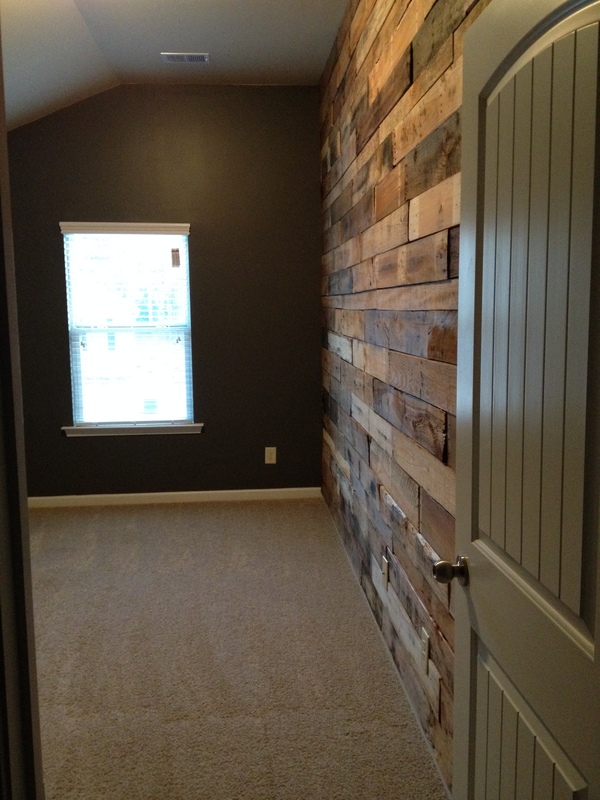 Row by row and board by board the pallet wall came together. It was a slow process but I was very careful to be sure that each row stayed nice and level. 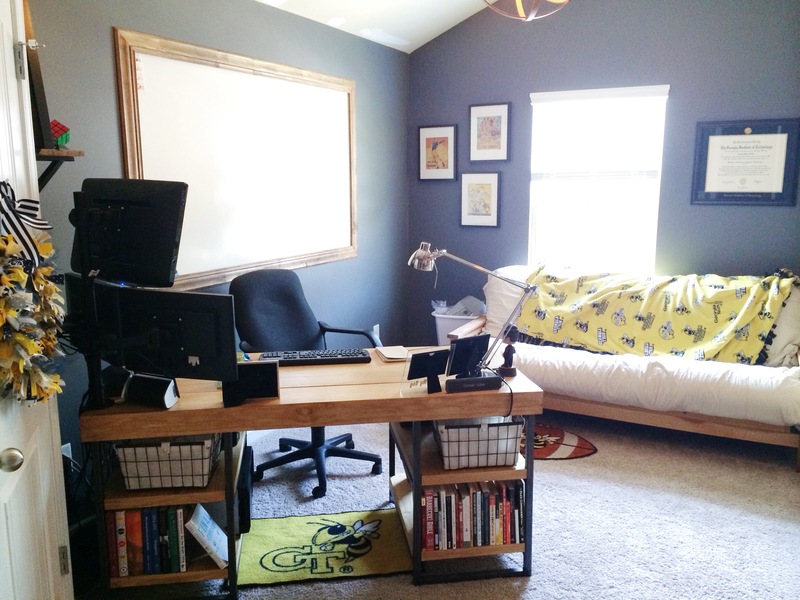 I also built a new custom desk, shelving, light fixture and a huge dry erase board to finish up all of the details. I enlisted the services of a local welder to build the frames for my desk and he did a fantastic job. I added wooden shelves and a top with a hidden drawer in front. 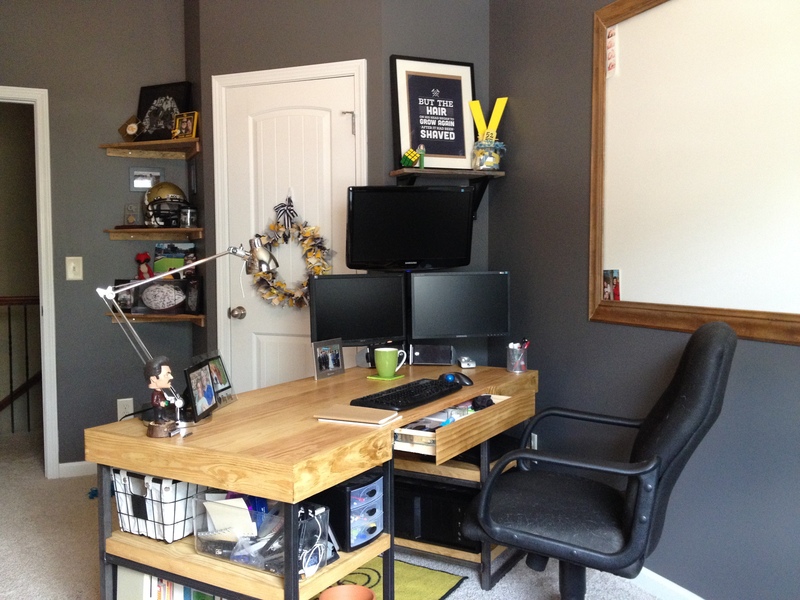 The desk was stained a very light color in order to contrast with the dark metal and walls. 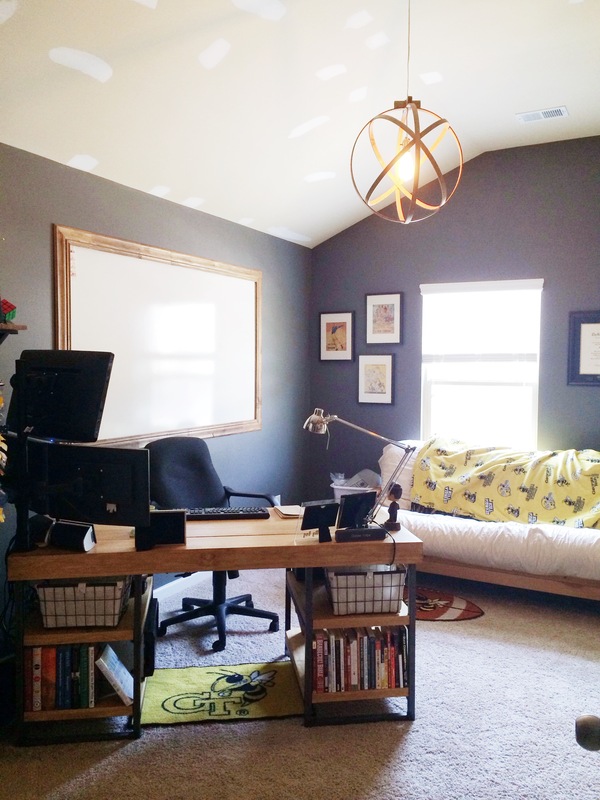 I used leftover pallet boards to create the corner shelves and dumpster-picked crown molding to frame the dry erase board. The board itself was created from a sheet of melamine-lined hardboard from Home Depot. A dry erase board that size from a normal office supply store would cost over $200, but a 4’x8′ sheet of tile board costs less than $15! The drywall spots on the ceiling are leftover from our 1-year warranty – they will be gone soon! 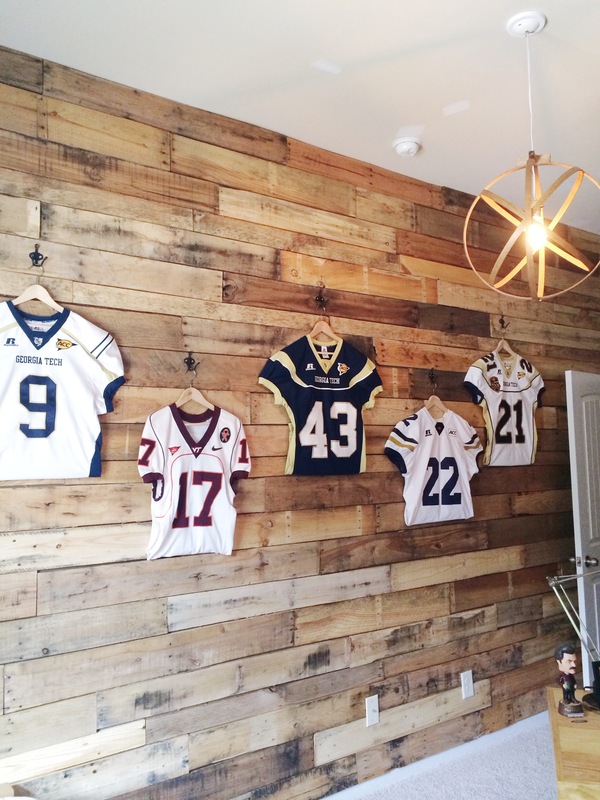 The shelves just inside the door display lots of my Georgia Tech Football memorabilia, my jerseys hang on the pallet wall, and the walls have GT programs from the 1940’s and a custom print from Jess Creatives. I’m so pleased with my rustic office and I’m so excited to work in here every day. Mandy did such a fantastic job designing, decorating, and inspiring and I couldn’t have done any of it without her. On to the next project! 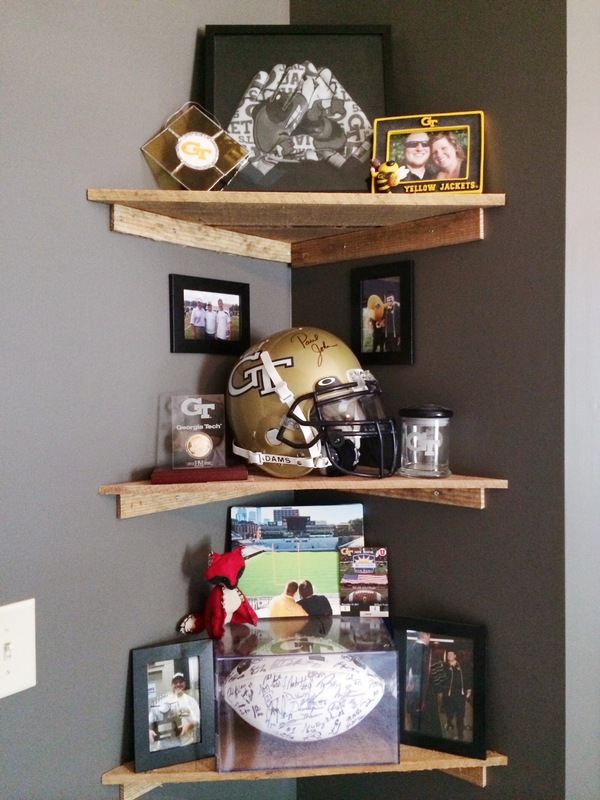 This entry was posted in DIY Projects, Home Tour, Uncategorized and tagged corner shelves, diy, fox den, georgia tech, office, pallet, pallet wall, rustic desk. Bookmark the permalink.